Flag your tribal style with Captain + Co personalised wall flags! Have I mentioned I’m currently sprucing up my youngest son’s bedroom? He’s turning ten in a couple of months and it’s proving to be a very tricky age to find appropriate decor things for, being not quite a tween. Captain + Co is a little ray of sunshine I stumbled over at Etsy, and boy I’m glad I did – this Tassie talent creates the most gorgeous wall decor bits and pieces to complement all kid’s spaces, no matter their age – it just fits and feels right. Perfect! The Tribal Feather Arrow Flag caught my eye instantly with its subtle fanciness. Kids love things made especially for them and that’s exactly what they get with Captain + Co. A personalised hanging flag made from lush thick felt hangs from a custom made arrow with real felt and leather feathers. I told you – fancy. Available in dark (black) and pale (ecru) flag styles, it’s up to you if you want the initial cut out from the felt flag or a contrasting initial attached instead. 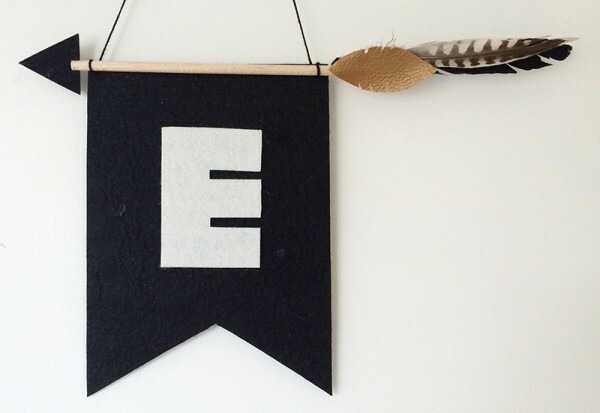 Perfect to hang on a door, a wall, even a shelf – you can order your Tribal Feather Arrow Flag, priced $30, over at Etsy direct from Captain + Co.